The ultimate goal humanitarian operations and innovation in general is to improve and enhance the human condition. With regard to humanitarian medicine and innovation, this is taken a step further with the fundamental element of alleviating human suffering and saving lives in the field. While the intentions are indeed very noble, innovation must be fostered by an evidence-based approach in conjunction with the tenets of human ingenuity. While indeed ideas open the door to novel interventions, if we are to make a true impact on the more than 63 million displaced refugees and conflict victims around the world, we must turn thought into action. The foundations provided in this book seek to take the ambiguity out of “innovation” and define its process, philosophy, and practical applications both now and in the future. Humanitarian innovation is perhaps the most extreme application of innovation, as it embraces the notion of creating something out of very limited resources. While indeed many may think that having limited resources serves as a detriment to the innovation process, we think quite the opposite. Resource-poor settings and unconventional environments employ people to think harder, deeper, and more efficiently. This creates a selection process whereby only the most practical and feasible ideas are embraced and pursued. At the end of the day, this breeds functional breakthroughs and innovations that display the same functional utility as those developed with ample resources. Furthermore, innovation is not embraced solely by highly educated professionals, researchers, academics, etc., but rather knows no bounds. The recipients and users of technological innovations often have as much or even more potential to innovate than the purveyors/creators of the innovation themselves. Ultimately, working together across geographic, socioeconomic, and geopolitical spectrums fosters dynamic creativity, enhanced problem-solving, as well as creates a better innovation. Human suffering is often viewed in the short-term in humanitarian operations; thus the interventions promoted are not suitable for perpetual application. By creating an innovation ecosystem that embraces the integration of an array of innovations ranging from 3D printing prosthetics to mHealth and blockchain technologies, we create infrastructure and human capital that will last into the future. This is where the notion of empowering refugee and conflict victim innovation comes into play. Who better to know the true realm of human suffering and the key to alleviating it than the actual people experiencing it firsthand. 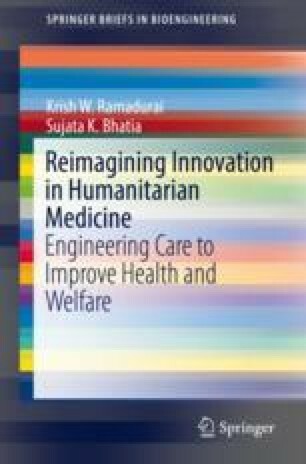 The future of humanitarian innovation lies not solely in the creation of novel technologies, devices, and interventions but more importantly in the knowledge transfer created and fostered. Health is fundamental element of the human condition, in which the bilateral transfer of knowledge is critical to empowering displaced individuals and promoting social equity.